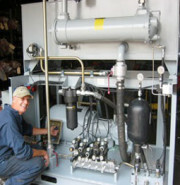 The history of innovation in hydraulics continues today with custom work from Bernell Hydraulics. Broadly defined, hydraulics includes all kinds of technology involved in the flow and control of fluids. In this sense, the field of hydraulics dates back thousands of years to the irrigation efforts of a variety of different ancient peoples. The ancient Greeks, Romans, and Chinese introduced further innovations that would qualify as early hydraulic machinery, such as hydraulic pumps, waterwheels, and hydraulic mining equipment. However, our modern idea of hydraulics as fluid power control is a much more recent development. The foundation of all modern hydraulic equipment is found in Pascal’s Law. In the 1640s, gifted French mathematician and philosopher Blaise Pascal conducted experiments resulting in an important mathematical equation describing the principle of transmission of fluid pressure. Pascal’s Law describes how a change in pressure at any point in an enclosed fluid results in the same undiminished change to all points in the fluid. In other words, the pressure throughout a closed system is constant. Spurred on by the Industrial Revolution, European engineers soon began experimenting with functions of the principle described in Pascal’s Law. One of the first such engineers was Joseph Bramah. Bramah patented a design for a hydraulic press in 1795. The press used a hydraulic cylinder to generate compressive force, which then was used to produce mechanical force. Bramah’s press quickly replaced the steam hammer as the machine of choice for metal forging in his time. An example of a contemporary use of a hydraulic press is a car-crusher. American inventor Harry Franklin Vickers is widely considered the Father of Industrial Hydraulics. A self-taught master machinist and Army-trained electronics and radio expert, Vickers had the skills and knowledge needed to combine hydraulics and electronics to create many new inventions. For example, he invented the first hydraulic power steering system and the first balanced vane pump. His company, Vickers Inc., is still producing all kinds of hydraulic parts today. The principles of hydraulics are all around us today, in the form of many different types of hydraulic equipment and machinery. Of course there are the obvious examples like mobile equipment, but hydraulics parts manufacturers like Parker are also exploring other applications like hydraulic-powered exoskeletons to help paraplegics walk. Innovation in the field of hydraulics goes on, and Bernell Hydraulics can help. If you need help designing or fabricating custom hydraulic parts or equipment, come to our shop. Our expert engineers and machinists will work with you to produce the high-quality products you need to achieve your unique fluid power control goals.